What's the one thing that almost all small venue musicians strive for when it comes to amplifiers? Some might say "pure immersive tone", which would undoubtedly be followed by "portability". 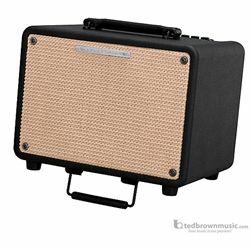 The Ibanez T-Series Acoustic Guitar Amplifiers deliver exactly that, along with the striking appearance of a hand-crafted boutique amplifier. Whether you're strumming away at the local coffee shop or playing weekly gigs at a religious venue, the sounds of the T-Series will fill the room. Plus, you won't have to break your back getting your amp in and out. The Ibanez T-Series was designed with portability in mind.